Using Nature’s Colors today. This is where the creativity happens! In the midst of chaos. As you can see this page too is filled with the colours of nature and the autumn season. What are you filling your pages with? 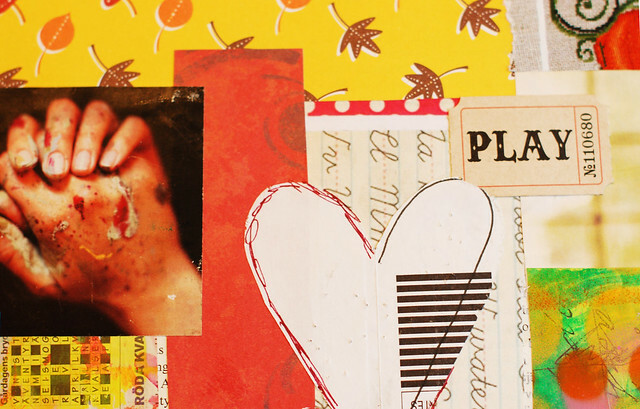 Remember, most importantly on all journal pages, it to add in the joy of play! This entry was posted in Art journaling and tagged art journal peek, autumn, messy, on my desk. Bookmark the permalink. Those pages are really fun! Lots to look at. 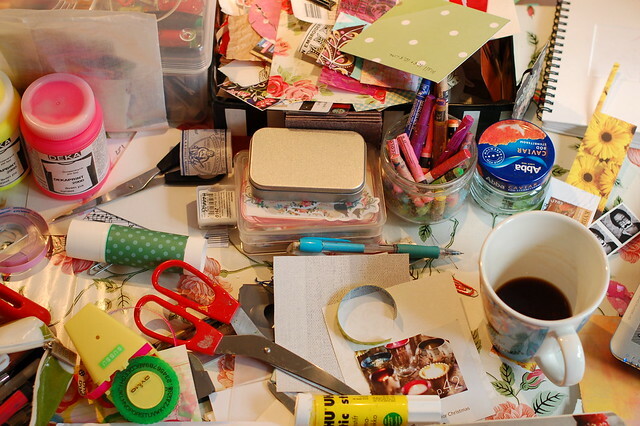 I also like seeing pictures of messy desks. Mine is always a disaster! Me too! 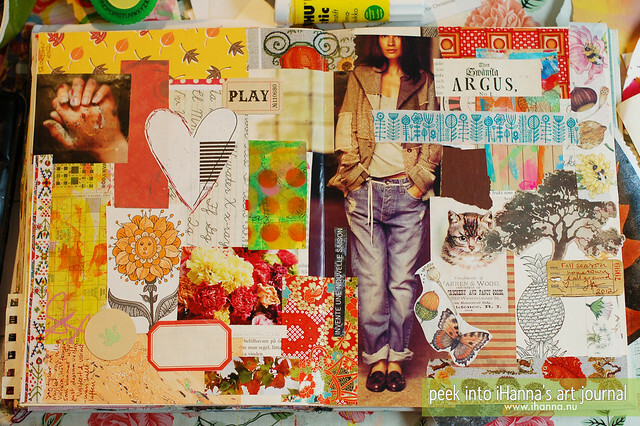 I love your journal pages!! 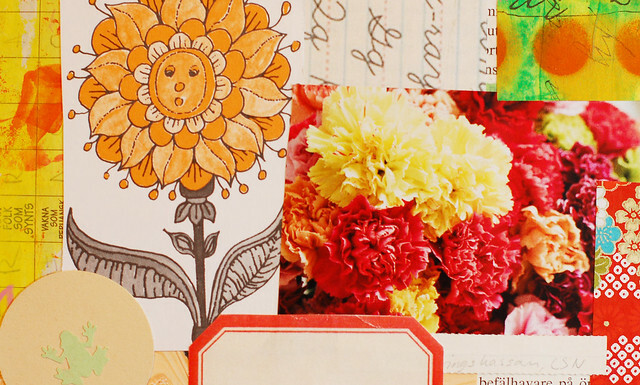 Thanks for sharing the creative chaos – SO pleased to see that others work in that way too! 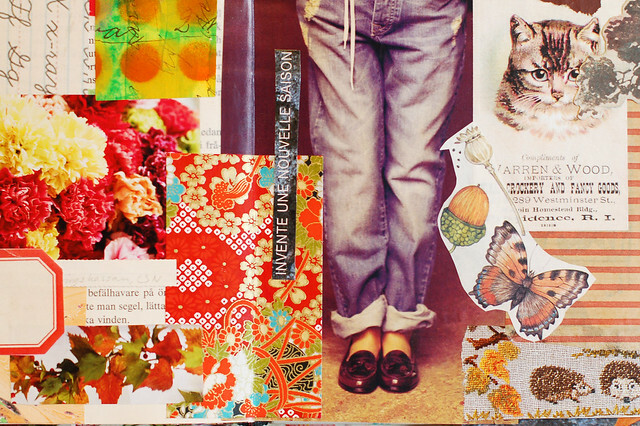 I’m always happy and very interested in reading all your posts about art journaling. I did something about a fall journal you can see here! your post today prompted me to take some photos of my mess, i tend to spread out around the house when creating, but everything comes back to my table to be sorted at some stage………well it had to be today as there was no room left on the table to work! your colour combinations work so well on these pages. Haha not fair…. I am neat…always. It’s true! :) I do love looking at your pages. Hanna, one of the reasons you inspire me is that you aren’t afraid to let go. I have a hard time letting go and putting layers and layers of things and lots of detail, but I do like seeing that, so I don’t know what my problem is. However, I’m never afraid to take a photo of my messy table. Sometimes those nice, neat, orderly studio pictures just make me feel cold. Beautiful chaos. I love it. Chaotic layers that all magically flow together into a gorgeous composition!